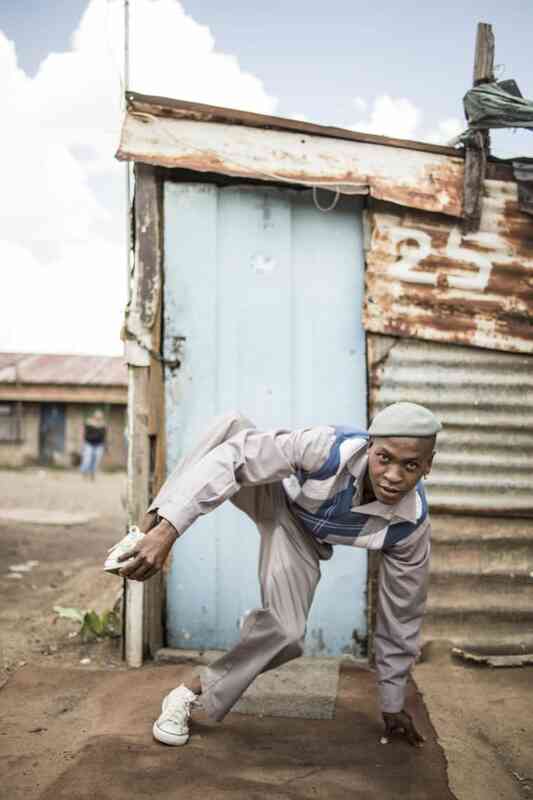 Chris Saunders captured the history of Johannesburg township pantsula in a critical new book. 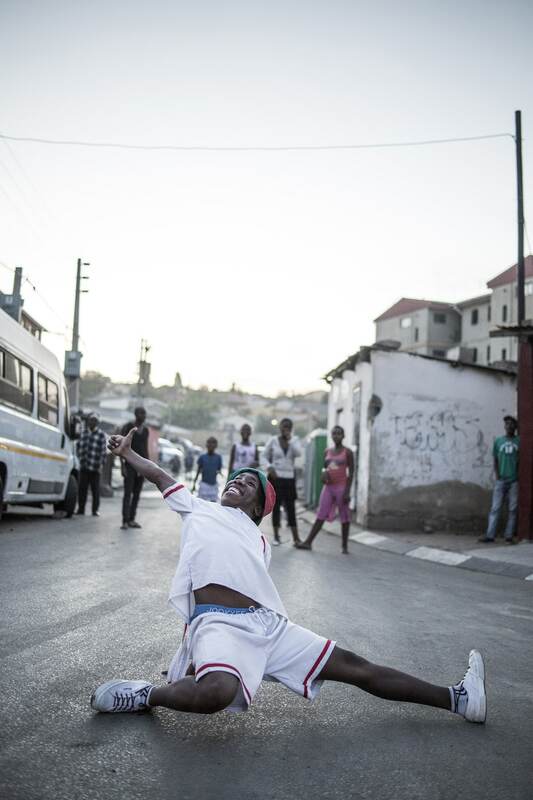 For 30 years, beginning in the 1980s, the South African dance pantsula has grown in popularity in the black townships surrounding Johannesburg, but it's only become a mainstay of the capital city’s overarching cultural fabric within the past few years. 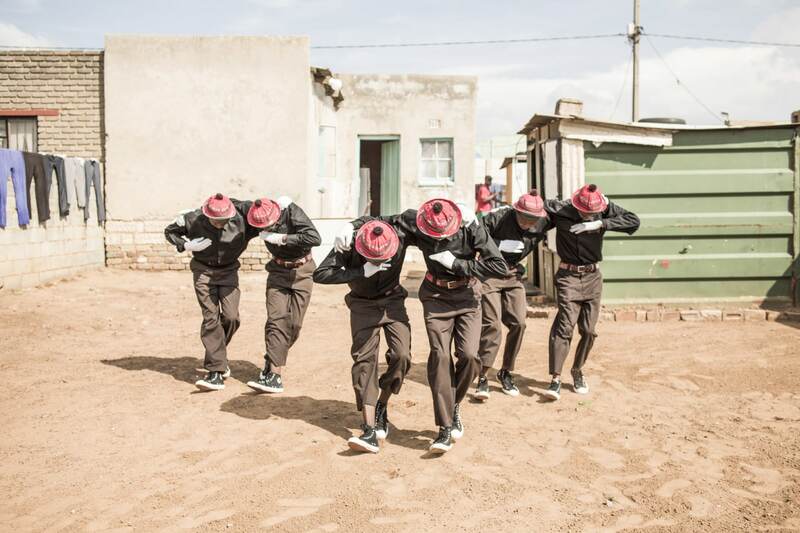 Now, for the first time, the popular dance will be documented as a whole in a new publication, Pantsula — Dance 4 Life!. 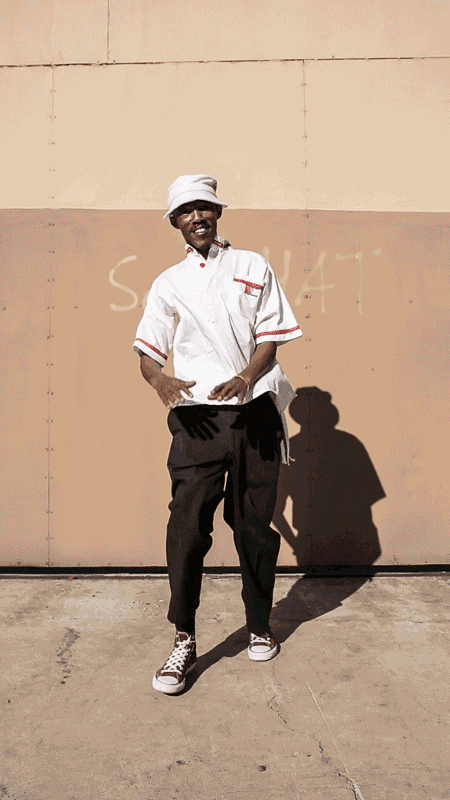 The book is at once a photographic survey by Chris Saunders, an academic study written for a popular audience by co-author and professor Daniela Goeller, and a personal account by dancer and co-author Sicelo Xaba, who’s been documenting his culture independently for years. It includes interviews with hundreds of dancers from over 30 teams, and features the views of community members, political activists, musicians, and DJs. 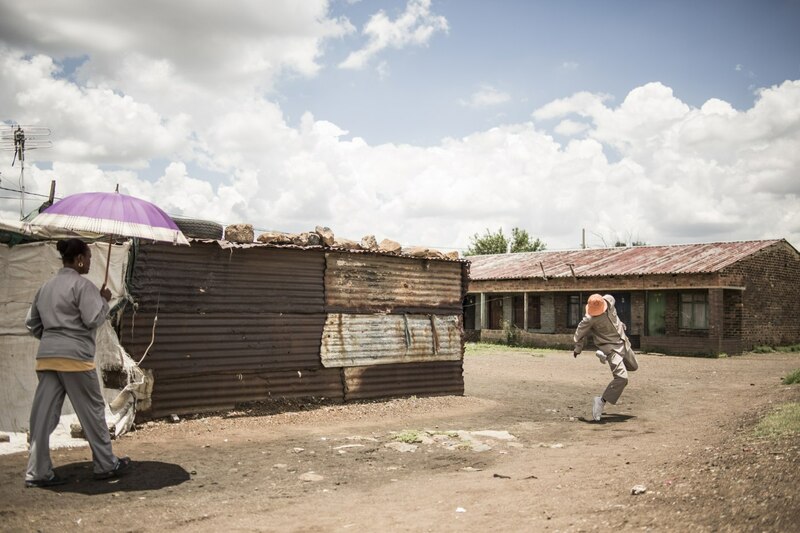 Each segment is completed and Saunders, Goeller, and Xaba have launched a crowdfunding campaign to bring pantsula’s history and ethos together in a physical publication. The book is set to be released in 2017. 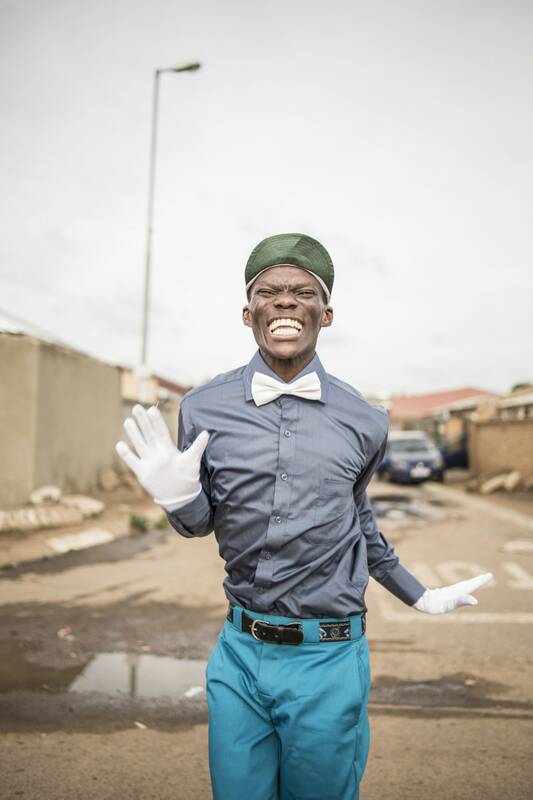 Pantsula was, according to Goeller, “developed from a fusion of traditional and modern dance, jazz and other music, and theatrical observations of everyday life’s gestures, such as mime, clownery, acrobatics and magical tricks.” Interpretations of the dance have evolved over time; it's taken the form of a solo freestyle dance, as well as a strict choreographed routine that tells a story. 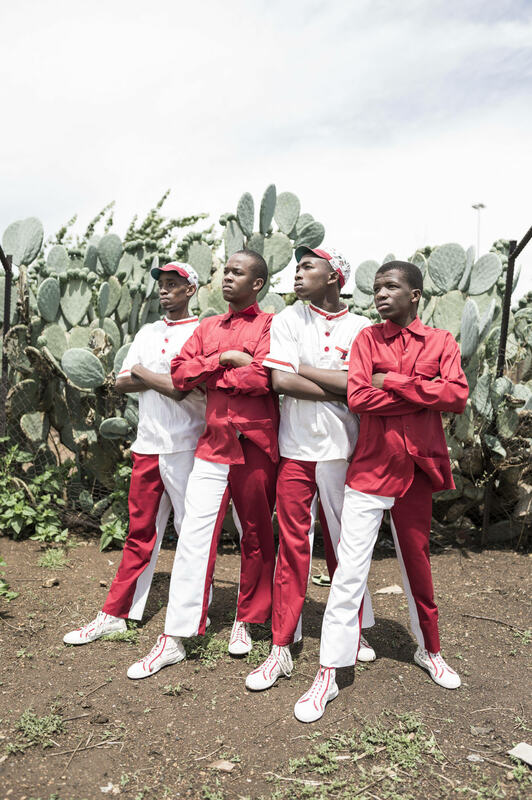 It’s hard to say how many pantsula dancers or teams there are for sure, but Goeller estimates at least 50 in and around Johannesburg alone. Crews are typically comprised of five to 10 individuals, although it varies. Some troupes boast over 20 members; Real Actions Pantsula is the largest, at 25. Dancers differentiate themselves through signature poses and movements, but one of the most common elements is the sparapara. 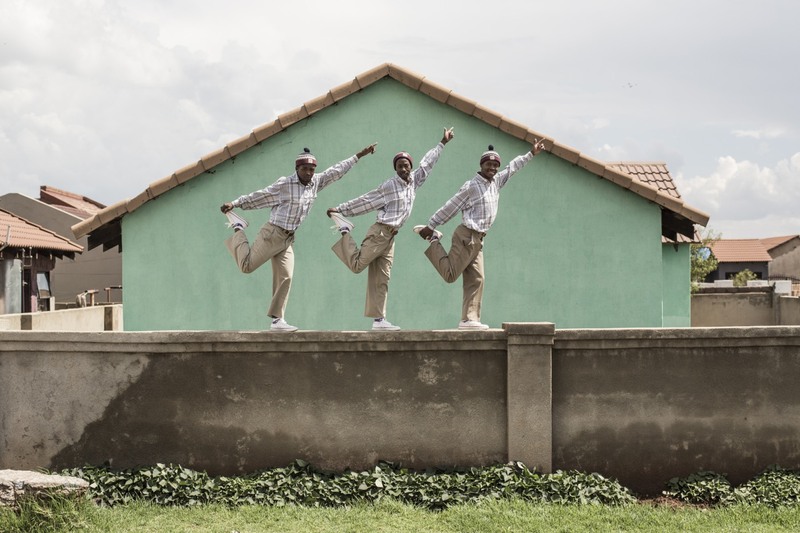 Copied from train surfers, it’s a sequence used in nearly all pantsula dance choreography. According to Goeller, "It consists of one beat on the right foot followed by two beats on the left foot, and is a reference to the difficult balancing act of jumping off a moving train and landing on a solid platform." When done repeatedly, it’s also meant to resemble the sound of the train. 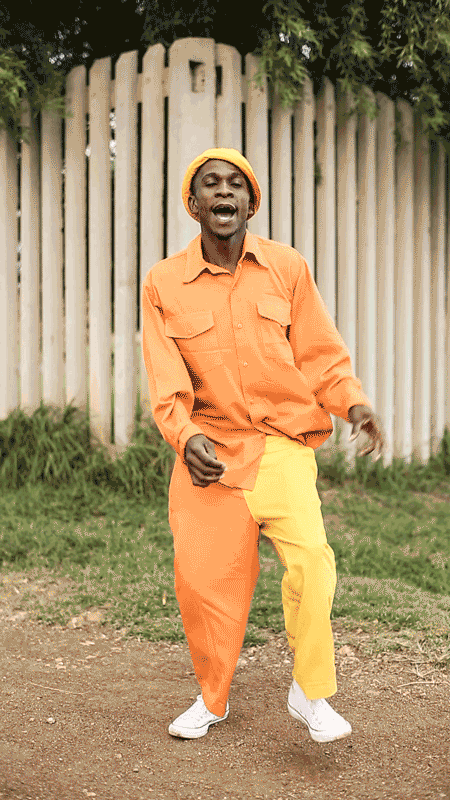 Style is also an important component to pantsula culture: many of the contemporary crews dress in brightly colored matching workers’s uniforms, which has influenced local trends nationwide. This intersection with fashion was what originally captured Saunders’s eye; he first became involved as part of an article for Colors magazine in 2010 and later connected with Goeller. 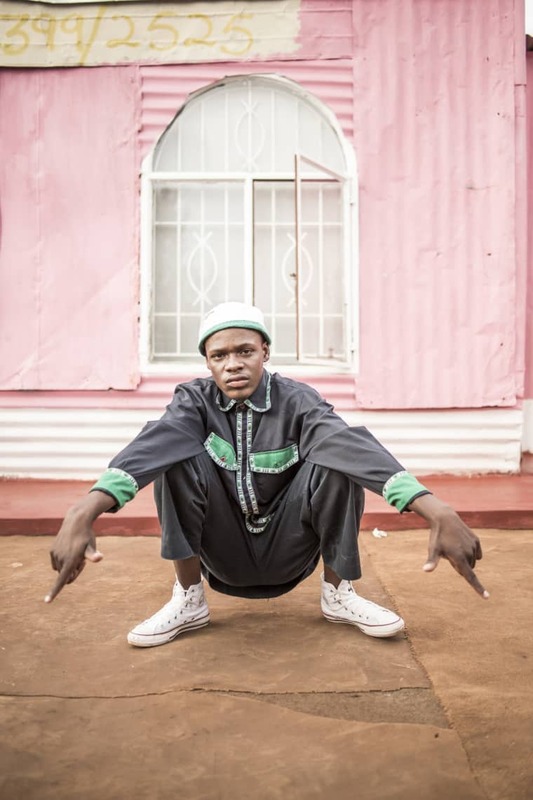 The FADER recently caught up with Saunders on Skype after a trip to Europe, and he talked about the history of pantsula, what’s in the book, and the complex city where the dance takes root. How did you first get involved with pantsula? I grew up on two sides of Johannesburg. I was in the South until I was 12, and then I moved to the North suburbs. Very different areas. I was on a residency called Fabrica in Italy, and we ended up doing a dance issue. I'd always done street fashion stuff in Johannesburg, specifically in Soweto, working with people like The Smarteez. It wasn't like it is now, where there's been a huge explosion of African fashion. The idea of young black guys from the townships in Johannesburg making this really incredible clothing was a really new thing in 2008. It's amazing to see the incredible growth in perception that the outside world has of African art and creativity in the past eight years. People were amazed such a short time ago by what seems common now. At that point, no one was shooting those photographs. It felt like no one was interested. Especially in the fashion world. It was a risky maneuver for me, but I found it fascinating and put it out there, and suddenly it sparked this little bit of interest. It was really cool to see people looking in that direction. But I went to Fabrica and started doing research on South African dance, came back, and did the article on one specific pantsula crew called Real Actions for Colors magazine. But I wanted to do a much bigger project and started researching, maybe someone had done it. But no one had. Once we started down the process, I realized why. It wasn't really easy to access the culture. There was a lot of protection around the information. These are career dancers; this is their life. So we had to create bonds and connections and take our time. The leaders of four main dance crews formed a foundation during the process, which became very important to the book. They had a lot of conversations between themselves out loud for the the first time. I had a simple visual style for the portraits. I would go in and ask the guys to dress like they were going to do a performance, and we would walk around the neighborhood they lived in and talk. Then we would do some dancing and they'd perform in the streets, which is where most of the guys learned to perform. Do people continue dancing in the street once they're more successful? They just dance all the time. It's as much a part of general street language and culture, a way they talk to each other. Whistling is a big part of the culture too, a language of its own. There's two variations of the dance. In street dancing, it's a solo style where they just kind of mess around and show off. Then there's the group choreographed performance, where they tell a story. If you need a bit of extra cash, you could walk into a tavern and perform. It's accessible. If they're doing really well and getting older, they might not do that anymore. Professionally, it's much better to be part of a crew with uniforms and music, because you can get bookings at proper events. Like weddings, government parades. At any big event in South Africa, pantsulas are booked. That was one of the reasons Sicelo and Daniela and a bunch of other guys formed Impilo Mapantsula. They were trying to form a general kind of place where outsiders interested in the culture could book pantsulas and access and network with them. They also help make sure they get paid. It's not an official body yet, they're applying for NGO status. Is the book under the auspices of Impilo? Ten percent of the proceeds go to Impilo, but it's already a three way publishing deal, plus the publishing and production costs, so it's not going to make much money. It's more about representation. Like how does a culture represent itself? As well as me, myself representing and photographing the culture. It's trying to enter that conversation that academics have at every conference about Africa where nothing ever comes of it. So this is a model, essentially, to allow people to have conversations in the future. It takes a lot of time. We're creating an archive. What was your exposure to pantsula growing up? Very little. Coming from a white background in South Africa during the transition, we weren't massively exposed to a lot of black culture. I had been exposed to Kwaito music, however, which had Pantsula dance in some of its videos. You'd see bits of pantsula, and be like, “Cool. That's interesting. But what is this culture?” There were songs that were coming out that were linked, but that was it. I guess it was like growing up in Nebraska and watching hip-hop videos from the ‘80s. That's how vast the separation was because of apartheid. It took years of people having conversations and being interested in assimilating into general culture to be exposed to each other’s cultures. But now people who don't know about pantsula, which is massive popular culture, don’t really have an excuse. There are thousands of people who are a part of it. That's why I never wanted to call it a subculture, because it was important to be seen as modern city culture. Almost everyone who grew up in a Johannesburg township, which is the large majority, knows what pantsula is. You can't really call it a little subculture. It's popular culture. By the time you were in college did you still have to make an effort to find it? In the early 2000s, South Africa was a vastly different place. It was late on the technology train. Now things are more public because kids here are talking about everything online. Back then you had to be in the privileged lot to have the internet. Now everyone's got smartphones. Information is being shared. Style seems integral to pantsula. How does it figure into the culture? Pantsulas basically popularized a lot of modern fashion trends in South Africa. Like wearing overalls. There was a protest element there: wearing your work clothes to perform in and talk about that in a kind of socialist, Communist way; wearing your work clothes everywhere. One uniform. But at the same time, for some of the guys, it was a form of accessibility. You could buy affordable clothes that were cool. Then there's the Converse shoes and DIckies. American working brands. It's aspirational. But it's not just an idolization of the West; it's a mix. There's no simple line of explanation in pantsula culture, and I think that's because it’s always evolving, always changing. From the ‘50s to now, they’ve always adapted and kept a fundamental aspect of the dance culture, a professional hybrid of all these different practices. It was like, “This is my tradition, this is my language. There’s 11 official languages in South Africa. This is why I'm here. This is my story.” Part of it is about storytelling. A lot of African stories were told traditionally through dance, song, and performance. That still plays a part in how stories continue to be told. There was also this idea of the townships, with all these people forced into environments by apartheid. You see all those things crashing together and this incredible culture coming out of it. For me, this is the closest you can get firsthand to the story, because they were telling these stories in the townships during apartheid about what was happening. It wasn't a writer going in and interviewing a guy, and reinterpreting the story. They were involved and this was their lives. Has it traditionally been male dancers? Yes, but there's a big collection of female dancers now. There's like ten crews that are pioneers, bringing females in. It's a very masculine culture. There were always women involved, but on a specific side of the culture. They would do their own dance, and men would do their own dance. Now it's joined, starting less than ten years ago. I've seen the number of women in some crews rise since I met them. Part of it may be because of the growing popularity of the culture. There were a lot of guys who had a very traditional mindset that women could never dance like a man. There are a lot of girls that are as powerful as the male dancers. Is pantsula associated with a particular style of music? In the ‘80s it was Kwaito music. In the ‘90s it was deep house. And now, techno. I’d even say gqom. The last guys that I shot played a couple of gqom tracks. I don't even know if they realized what gqom is. They’re just like, this is great for dancing! I’ve never heard a pantsula dance not set to electronic music. It goes hand in hand. What's the secret to the floating hat trick? That trick! It's like all about having really powerful lungs I guess. You blow the air out of your tongue into the hat. That's how you keep it there. You have to keep your lips in a shape. It's completely nuts. I've only seen three or four pantsulas who can do it. I've shot a series of videos of classifiable steps and a movement series and I want to create flip books. That's part of the project. By bringing all these different crews together, they managed to decide on a lot of things, like even how to spell certain things after arguing over three different spellings. You have to have some form of agreement. It's like, the council has declared! What five pantsula crews should readers should keep up with? Oh, I hope this doesn’t get me in trouble [laughs]. OK, this is a list that is very much from my perspective. I’m going to try and pick from various areas. Here we go: Intellectuals Pantsula, from Soweto. Real Actions Pantsula, from Orange Farm. Via Vyndal, from Alexandra. City Boys and VIP, both from Sebokeng. Was it difficult getting the dancers to engage with you at first? In a broad sense. At first I worked with one crew and built a relationship with that group of people. Then we experimented with trying to capture the other dancers. That was the hard part. Going to a neighborhood and trying to find guys. Some of them work. Some are completely professional. There are street dancers, historical dance crews. A deep mixture. We shot over 40 crews, and did an interview with each one. I was always with Daniela except once. It was just so difficult to even make contact with the groups, it was very important we were together when we finally got the opportunity. The city is separated because of the way the apartheid government planned it. That's sort of how pantsula formed in its different neighborhoods. It's the township culture. There's the white city in the middle, and then essentially labor camps planned on the outside. It was all about mining, and they needed labor to work in the mines. The townships are now developing like towns and little cities of their own now — they've changed completely. But the topography of the city has a vast importance. We're actually going to make a map for the book, that's coming with the last step of the funding. I want to show where the crews are from and how the city works. It's a city that was built in this oppressive nature, and now has to develop into something new. Form a new, modern identity. A multicultural, mixed class society. And cultures like pantsula are part of that. There’s a lot of modern dance, modern storytelling elements about the trains, work, HIV, and life in the city. When you watch a good choreographed performance, you pick up on bits and pieces of all that. You've got guys that tell very linear stories, like drama. Then there's guys who are more abstract. You've got different people, telling different stories, in different ways, with different interpretations. It's a whole language of its own.